The vivo V5 is powered by the dated and mediocre MediaTek MT6750 chipset - it sits a step below the Helio P10, and it didn't even deserve a pet name that's easier to remember. 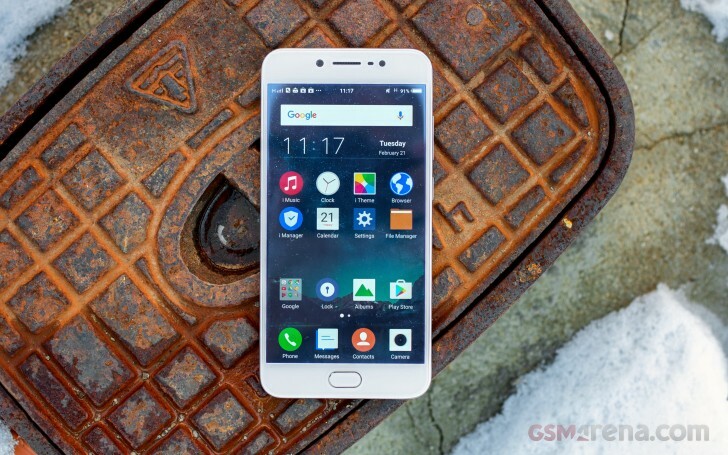 It packs a true octa-core Cortex-A53 processor clocked at 1.5GHz. The GPU is nothing special - the Mali-T860 MP2 (read: dual-core), but there are 4 gigs of RAM on board, so that's something. The same MT6750 chip is the one behind the Meizu M5 and M3, and it has proven to be enough for those devices. The raw graphics performance provided by the weak Mali-T860 MP2 GPU is rather uninspiring. It's worth noting that the GPU at least supports the latest OpenGL ES 3.1. While the offscreen raw scores are nothing to talk about, the onscreen framerate are helped by the lower 720p resolution, and thus the V5 ends up better than most of its competitors. Meizu M5 Note is powered by the Helio P10 chip, which has the same GPU but running at a higher frequency. You can see the performance gap between the V5 and the M5 Note in the BaseMark X test - when the GPU is that weak, even the tiniest upgrades matter. Compound benchmarks such as AnTuTu and BaseMark OS II give us a better understanding of the overall performance. Here, the vivo V5 stands okay next to the competition even though it's still trailing behind. The MT6750 chip is the definition of mediocrity. The benchmark tests show the vivo V5 is a below average performer. It may provide an acceptable user experience, but we expected a bit more - especially at this price point. And the competition is ready to give us that extra bit of oomph at the same or even lower price.